The system alignment should be checked and fine tuned if needed on its first revolution of the year. If the alignment is changed after a wheel track is established, the compression and/or tensions are magnified because te system is trapped in its wheel tracks. Trailing bow. This situation is most critical as it causes a compression of the entire machine. When the spans are compressed, they tend to lose their inherent strength. Leading bow. A leading bow can cause problems by creating extreme tension or pull that could cause structural damage. A trailing bow is not acceptable, but a slight leading bow is tolerable. However, if the system is operated in forward and reverse, the leading bow in one direction is the trailing in the other direction. Therefore, such a system should be aligned to operate in as straight a line as possible. Ensure the switch pivot arm and adjusting tab takes no more than 1/2 lb. of pressure to rotate. It is necessary to remove the control bar and cam plate spring (inside the box) to check this. Repair will require some disassembly of the tower box. Ensure all of the hitch balls are tight. A loose ball allows the span connection to change. This in turn changes the micro-switch reaction times. Make alignment checks part of annual spring start up, because proper alignment contributes to extended structural life. Set the percentage timer between 50% and 70% (depending on your pace) and start the Pivot irrigation system in either direction (forward or reverse). Beginning three drive units from the Pivot, one person sights an imaginary line from the center of motor 3 to the edges of motor 1 (looking toward the Pivot). 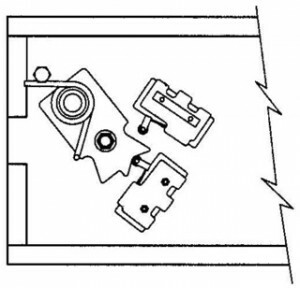 Motor 2 is to stop at position A and start at position B. The adjustment is correct when motor 2 starts and stops equal distances relative to motor 1. The first drive unit can be aligned by sighting between motor 2 and the vertical riser pipe of the Pivot. If adjustment is necessary, the tower is realigned by adjusting nuts and bolts for each drive unit. Precautions to take into account: never adjust nuts more than 1/4 turn at one time; always adjust, retighten bolts and allow the tower to cycle twice (stop and start) prior to making additional adjustments. 3 responses to "Fine tuning system alignment"
Hello, I am looking to start a career in Pivots. I’m interested in information on center pivots for trouble shooting, most common issues, etc. This post is very informative and easy to understand. It was very helpful for me in performing one of the most important tasks in Pivot maintenance: span alignment. We’ve had some trouble with misalignment with our Pivot irrigation system. By the sound of it, this could be due to trailing bow. It needs to be replaced.